So I’ve been getting a few requests for sewing tutorials from people who are interested in learning how to sew their own clothes. So here’s my crash course! I’m pretty much just learning to sew as I go, so I’m no expert. Everything here is summary of what I learnt in my Beginner’s Dressmaking Class. Hopefully you find something useful here! For this, I’m going to assume you know how to use a sewing machine. The best way to learn is to get a sewing machine. Read the manual and just experiment sewing on fabric until you feel comfortable on your machine. Every machine is different so it’s important that you get the hang of your own machine. Sewing machine – As I said above, all machines are different, so I’m leaving it up to you to get to know your own machine! Pins – I prefer glass headed pins so that it won’t melt under the iron! Unpicker/seam ripper – My sewing best friend. This unpicks all the stitches which you sewed by mistake. Fabric – The pattern should say the ideal type of fabric for the garment you are sewing. Make sure to wash your fabric before you sew it! You’ll find that over time your collection of sewing materials will increase with the more skills you learn. STEP ONE: Get yourself a pattern! A pattern is pretty much a little package which comes with a template on all the parts of the garment and instructions on how to put it together. You can buy patterns for all kinds of garments! Pants, dresses, tops, jackets and even costumes. There are several places where you can buy patterns from. I live in Australia and I usually buy them from Spotlight or Lincraft. There’s usually a table in the corner of the fabric section with books of patterns. Flip through the books until you see a pattern you like, write down the pattern number and company, bring it to the counter and ask for that particular pattern. At the back of your pattern envelope (or sometimes on the pattern itself) you’ll see a chart with measurements, sizes and the amount of fabric you’ll need per size. Take your measurements. Your measurement should align with a particular size. This will be the size you will sew your garment. Once you’ve worked out your size, purchase the amount of fabric you need. The envelope should say it underneath your size. Most patterns usually come with more than one garment. In the pattern below, there are 4 types of garments you can make. I wanted to make Men’s T-Shirt B. 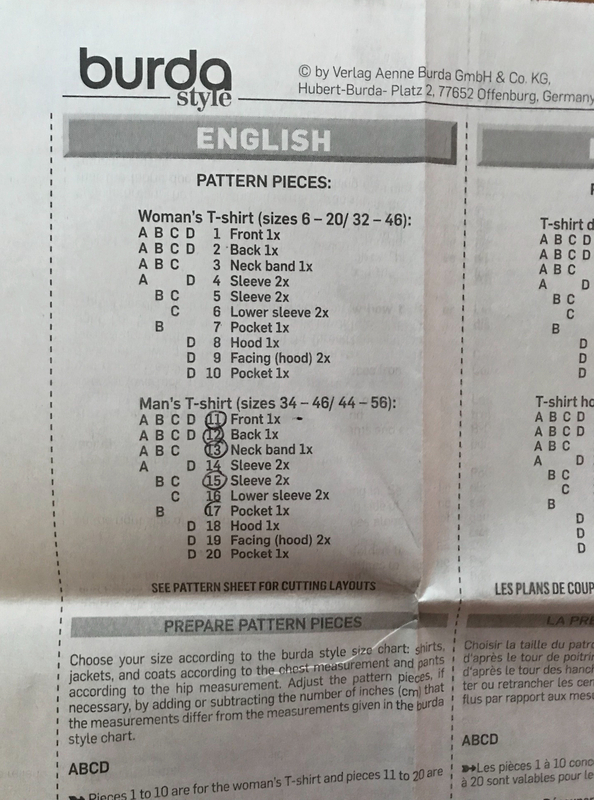 On the instruction papers, there is a list of all the pattern pieces and which piece belongs to which garment. To avoid losing track, I usually circle all the pieces that I need. You’ll find a whole heap of brown tissue in your envelope with a whole heap of pattern pieces. Lay it all out and cut out the pieces you need. 2. Fold the fabric in half, right sides together. The right side is the side that will be showing on the outside. The selvedge needs to be in line with each other too when you fold it in half. You can tell which side is the selvedge, by the looking for the edge of the fabric where you see holes. This is where the machine weaved in the creation of the fabric. The selvedge is NOT the edge that was cut in the store. Aligning the selvedge together is important because fabric has a way it naturally wants to fall. To make sure your garment falls the way it is meant to, you will need to work with the fabric’s natural state. Step 4 will be important for this too. 3. On the pattern or instruction sheet, you’ll see a guide on how to lay out the pattern pieces on the fabric before cutting it. You don’t always have to follow it but it is the recommended way to avoid wasting your fabric. 4. Make sure the “straight grain” (which I have circled on the image below), lines up with the selvedge (which I have labelled with a matching arrow). You can double check this with a tape measure to make sure it’s aligned e.g. if the straight grain is 10cm from the selvedge on one side, make sure it’s 10cm away on the other side. Not only is this important in making sure that you’re working with the natural state of the fabric, it is also important when it comes to using a fabric with a print. Here I used a Marvel print. Aligning the straight grain ensures the print is going to run in the same direction when you wear it. 5. When you’re ready, pin the pattern pieces to the fabric in place and cut it out. Use your fabric scissors to do so. Your pattern envelope will come with an instruction manual on how to sew the garment together. You may not use all the instructions there. Find the one that is relevant to what you are sewing. In my case I was sewing Men’s T-Shirt B, so I only looked at the instructions for Men’s T-Shirt B.
Don’t forget to use pins to hold it in place and take out the pins as you are sewing it through the machine. If you find it’s moving around too much as you are sewing it, feel free to add extra pins or tack it to hold it in place. press it open with an iron and sew a row of stitching along it. Use your pinking shears to cut as close to the sewn edge as possible. As you can see it has a zigzag edge which will protect the fabric from fraying. Some garments require you to use iron-on interfacing on some pieces. It stiffens the fabric for example with collars and cuffs. You iron it onto the wrong side of the garment so it won’t show on the outside. Be sure to press the piece (which is to place the iron down for a few seconds and lift it then move to the next section) as opposed to running the iron back and forth like what you do when you normally iron your clothes. I usually place a handkerchief above the interfacing to prevent the fabric from getting burnt. When I sewed The Kimono, I made the mistake of not pressing and running my iron back and forth instead. It ended up looking rippled and I had to start this piece all over again! Take it one step at a time. It can get overwhelming if you look too much at the steps ahead. Focus on what you’re doing now and the rest will work itself out. Get extra help when you need to. When I sewed my Harry Potter Robe, I got stuck and asked for help from a woman who does alterations for help. It was a life saver! You can also go to Facebook pages, I usually go to the McCall’s & Simplicity Group. Everyone there are super friendly and always willing to help you out with your questions. Ask the workers at the fabric stores for help. I’ve walked in so many times with dressmaking questions. I admit some stores are more helpful than others, but it doesn’t hurt to ask. My local Spotlight store has super helpful staff who know what they’re talking about every time I ask for help. Sew something you actually want to wear. It’s extra motivation for you to actually finish it to the end. It’s extra rewarding once you go out and wear it! 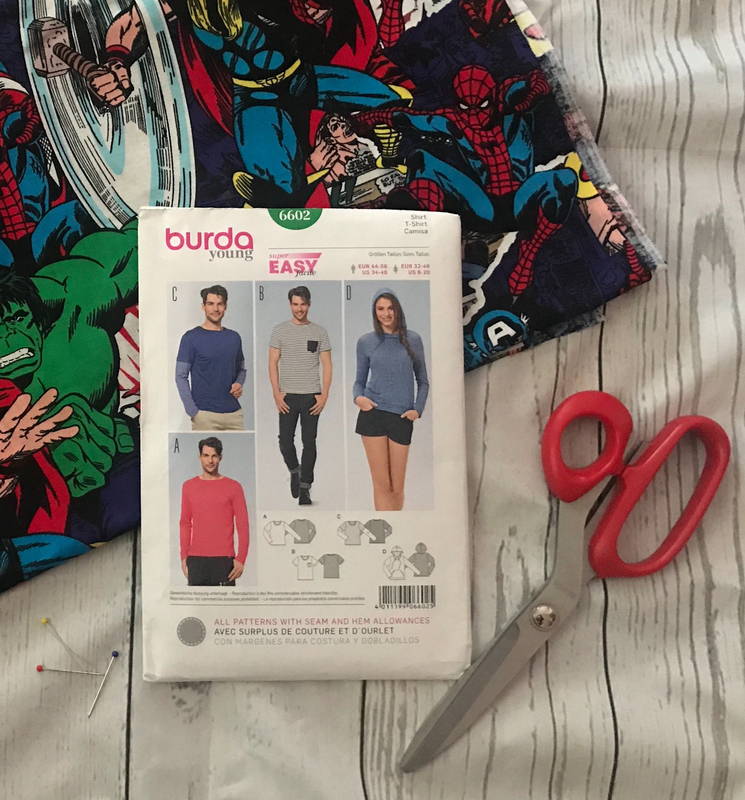 A quick google of easy-to-sew Simplicity Patterns or any other pattern company you want to have a go at will lead you to some great beginner patterns! The first project I sewed for this blog, The Kimono, was a Simplicity “easy-to-sew” pattern and I loved the way it turned out! Don’t underestimate the “easy-to-sew” label! If you have any requests for future tutorials, questions about this tutorial or any sewing related questions. Feel free to comment below.